Columbus Music and Art Academy offers high-quality drawing and painting art classes for children ages 4-18 from Columbus, Dublin, Powell, Upper Arlington and other Central Ohio communities. 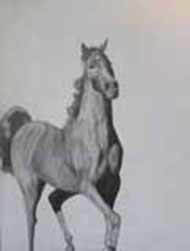 The art classes teach children correct drawing and painting techniques, line movement, shading, proportions, composition, and color concepts. At the end of the school year art students submit their artworks to the Annual Art Exhibition that is traditionally held in May. Why Columbus Music and Art Academy? We offer a unique and very successful art curriculum with focus on drawing and painting. Each child receives personal attention from the art instructor. All students present their art works at the annual Art Exhibition. In addition to art classes, our students can take choir and music theory classes. August 18: Line and Shape – Graphite Pencil. Students will learn the basics of line and shape and will use their knowledge to create a variety of invented images. August 25: Still-life Drawing – Graphite Pencil. Students will use their knowledge of line and shape to render an image of an observed object. September 8: Understanding Colors – Oil Pastels. 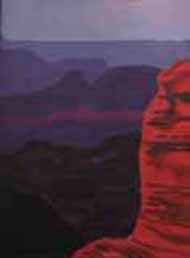 Students will learn basic color mixing rules and will use them to create a colorful image. September 15: Painting Basics – Acrylic Paints. Students will learn the basics of how to use a paintbrush and palette. Students will use their knowledge to create a colorful image of an observed object. September 22: Face Drawing Day 1 – Graphite Pencil. Students will learn basic rules for drawing a human face. September 29: Face Drawing Day 2 – Graphite Pencil. Students will complete their portrait drawing. October 6: Chuck Close Collaborative – Acrylic Paint. Students will work together to create a large-scale portrait inspired by the artwork of Chuck Close. October 13: Keith Haring Figure Drawing – Graphite Pencil/ Marker. Students will use Keith Haring’s artwork to help them understand basic figure drawing principles. October 20: Figure Drawing – Graphite Pencil. Students will use line, shape, and details, to draw a realistic representation of a person. October 27: Monster Drawing – Graphite/ Colored Pencils. Students will use their knowledge of figure drawing and a creative license to distort proportions and create several creature drawings. November 3: Tree Painting– Acrylic Paints. Students will learn several different ways to use their paintbrush to create a colorful image of a tree. November 10: Leaf Drawing – Oil Pastel/ Watercolors Students will use observation of line and shape to draw fallen leaves. November 17: Animal Drawing – Graphite Pencils. 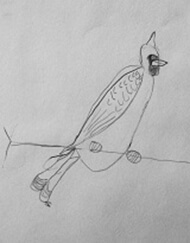 Students will learn how to use shape, lines, and details to draw realistic animals. December 1: Clay Vessel (Day 1)– Air-dry Clay – Acrylic Paint. Students will use a hand building method to create a small clay vessel. December 8: Clay Vessel (Day 2) – Air-dry Clay – Acrylic Paint. Students will Paint. a story on their clay vessel. December 15, 22, and 29: No Classes. January 5: 3-D Drawing – Graphite Pencil/ Colored Pencils. Students will learn how to turn 2-Dimensional shapes into 3-Dimensional shapes using rules of perspective and value drawing. January 12: Winter Landscape Painting – Graphite/ Acrylic Paints. Students will learn how to paint a winter landscape. January 19: Wayne Thiebaud Painting – Acrylic Paints. Students will draw a 3-Dimensional food item and will paint it using the warm and cool color techniques of artist Wayne Thiebaud. January 26: Snowflake Symmetry Drawing – Graphite Pencils. Students will learn about symmetry and will use it to render several detailed invented snowflakes. February 2: Snowflake Relief Prints – Water based Printing Ink Students will use one of their snowflakes from the previous lesson and will create a series of relief prints. February 9: Polar Animal Drawing – Graphite Pencils. Students will learn how to use shape, line, value and texture to draw an image of a selected animal. February 16: Profile Portrait Drawing – Graphite Pencils. Students will learn how to draw a portrait from a profile point of view. February 23: Cartoon Faces – Graphite Pencils/ Colored Pencils. Students will learn how to break the rules of portrait drawing to invent their own creative faces. March 2: Picasso Inspired Portraits – Acrylic Paints. Students will learn about Cubism and will create their own Cubist portrait painting. March 9: Hand Drawing – Graphite Pencils. Students will learn several drawing techniques that will help them to draw realistic hands. March 16: Drawing A Room – Graphite/ Colored Pencils. Students will learn how to use perspective to draw a 3-dimensional interior space. March 23: Motion Drawing – Graphite/ Colored Pencils. Students will learn several techniques for drawing an object in motion. 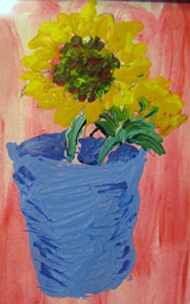 March 30: Impressionist Still Life Painting – Acrylic Paints. Students will use the artwork of Impressionist Painters as inspiration for painting their own image of an observed object. April 6: Impressionist Landscape Painting – Acrylic Paints. Students will use the artwork of Impressionist Painters as inspiration for painting their own image of a landscape. April 13: Georgia O’Keeffe Abstracts – Watercolor Pencils/ Paint. Students will use the artwork of Georgia O’Keeffe as inspiration for creating their own abstract paintings. 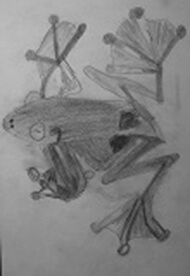 April 27: Zoo Animal Drawing – Graphite Pencils. Students will use their animal drawing skills from earlier in the year to work on drawing their own animals from observation. May 4: Outside Drawing – Graphite Pencils. Students will learn how to use line and shape to draw nature from observation. May 11 (Last Day): Drawing Games – Graphite/ Colored Pencils. Students will learn several drawing exercises that require cooperation and creativity. August 18: Blind Contour Drawing - Colored Pencil. Students will learn a drawing technique that teaches careful observation and hand-eye coordination. August 25: Still-life Drawing – Graphite Pencil. Students will learn basic rules of drawing from observation and will render an image of selected objects. September 8: Value Drawing Day 1 – Charcoal Pencil. Students will learn different techniques for drawing with value. September 15: Value Drawing Day 2 – Charcoal Pencil. Students will use their knowledge of value drawing to add dimension to a drawn object. September 22: Composition with Shapes – Graphite Pencil. Students will learn basic rules of composition and will use them to carefully assemble imagery using shapes. September 29: Understanding Color – Acrylic Paint. Students will learn basic and advanced color mixing techniques and principles. October 6: William Wegman Painting Day 1 – Acrylic Paint. Students will use the artwork of William Wegman as inspiration for completing their own painting. October 13: William Wegman Painting Day 2 – Acrylic Paint. Students will finish their William Wegman inspired painting. October 20: Portrait Drawing (Day 1) - Graphite Pencil. Students will learn basic proportions of a human face. October 27: Portrait Drawing (Day 2) – Graphite Pencil. Students will learn basic proportions of a human face. November 3: Chuck Close Collaborative – Acrylic Paint. Students will use the artwork of Chuck Close as inspiration for creating their own large scale portrait. November 10: Figure Drawing (Day 1) – Graphite Pencils. Students will learn Basic figure drawing techniques. November 17: Figure Drawing (Day 2) – Graphite Pencils. Students will use their knowledge of the figure to draw a realistic person from observation. December 1: Paint. Like the “Masters” – Acrylic Paint. 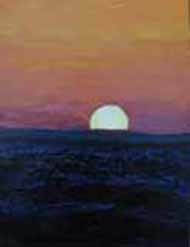 Students will select a famous Paintingand will try to create their own version of it by duplicating the colors and the brush techniques. December 8: Paint. Like the “Masters” – Acrylic Paint. Students will select a famous Paintingand will try to create their own version of it by duplicating the colors and the brush techniques. January 5: Perspective Drawing (Day 1) – Graphite Pencils. Students will learn rules of perspective drawing and will use them to draw their own invented 3-Dimensional Space. January 12: Perspective Drawing (Day 2) – Graphite Pencils. Students will learn rules of perspective drawing and will use them to draw their own invented 3-Dimensional Space. January 19: Wayne Thiebaud Thumbnails – Graphite Pencil Students will learn the process of thumbnailing in preparation for a painting project inspired by the artwork of Wayne Thiebaud. January 26: Wayne Thiebaud Painting (Day 1) – Acrylic Paints. Students will use the artwork of Wayne Thiebaud as inspiration for creating their own colorful representation of an invented 3-dimensional object. 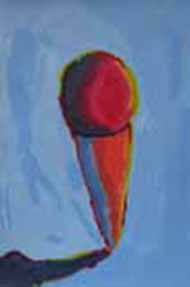 February 2: Wayne Thiebaud Painting (Day 2) – Acrylic Paints. Students will use the artwork of Wayne Thiebaud as inspiration for creating their own colorful representation of an invented 3-dimensional object. February 9: Animal Drawing (Day 1) – Graphite Pencils. Students will learn how to use shape, line, texture, and value to create a realistic rendering of an animal that they choose. February 16: Animal Drawing (Day 2) – Graphite Pencils. Students will learn how to use shape, line, texture, and value to create a realistic rendering of an animal that they choose. 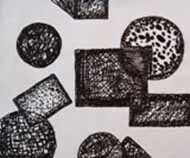 February 23: Pen and Ink Drawing -Ink Pen Students will learn how to use texture and pattern to create value. March 2: Facial Feature Drawing – Graphite/ Charcoal/ Pen and ink Students will draw a realistic image of a selected facial feature using their preferred drawing medium. March 16: Interior Perspective Drawing – Graphite Pencils. Students will learn how to use rules of perspective to render an invented interior space. March 23: Motion Drawing – Graphite/ Colored Pencils. Students will learn several techniques for rendering an object in motion. March 30: Still Life Painting Day 1 – Acrylic Paints. Students will use observation of shape and color to render an image of selected objects. April 6: Still Life Painting Day 2 – Acrylic Paints. Students will use observation of shape and color to render an image of selected objects. 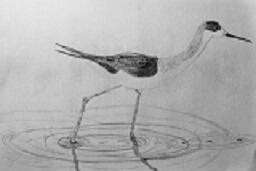 April 13: Glass Drawing – Charcoal Pencil. Students will learn how to use highlights and shadows to render a realistic image of a glass object. April 27: Final Drawing Project Day 1 – Various Materials. 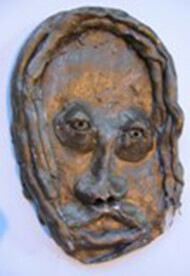 Students will create a final project using their own chosen subject and drawing medium. May 4: Final Drawing Project Day 2 – Various Materials. Students will create a final project using their own chosen subject and drawing medium. May 11 (Last Day): Final Drawing Project Day 3 – Various Materials. Students will create a final project using their own chosen subject and drawing medium. September 8: Charcoal Still Life Drawing Day 1 – Charcoal Pencil. Students will use charcoal and value to render observed objects. September 15: Charcoal Still Life Drawing Day 2 – Charcoal Pencil. Students will finish their observational drawing. October 6: Self Directed Color Project Day 1 – Acrylic Paint. Students will render an image of an observed object in color. October 13: William Wegman Painting Day 2 – Acrylic Paint. Students will finish their observational painting. November 24: No Class December 1: Paint. Like the “Masters” – Acrylic Paint. Students will select a famous Paintingand will try to create their own version of it by duplicating the colors and the brush techniques. March 16: Interior Perspective Drawing – Graphite Pencils. Students will use rules of perspective and observation to render an image of a space in the building. April 27: Final Project Day 1 – Various Materials. 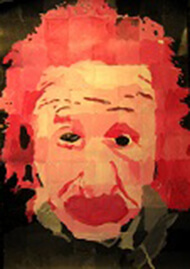 Students will create a final project using their own chosen subject and medium. May 4: Final Project Day 2 – Various Materials. Students will create a final project using their own chosen subject and medium. May 11 (Last Day): Final Project Day 3 – Various Materials. Students will create a final project using their own chosen subject and medium. Erik Kotheimer has been teaching drawing and painting classes at Columbus Music and Art Academy since 2009. He teaches classes for all ages and skill levels. Erik is an Ohio native, from the Cleveland-Akron area. He received a Bachelors degree in Art Education from Kent State University in 2006. Upon graduating he moved to the Columbus area to pursue a full time teaching position in a school system, but fell in love with working with small groups of gifted students. Since then, he has had the opportunity to teach for a variety of institutions in the Columbus area including the Art for a Child's Safe America Foundation,The Grove City Parks and Recreation Department, The McConnell Arts Center in Worthington, The City of Upper Arlington, Blick Art Materials, and Girl Scouts of America. Karyn Vogelpohl received her Bachelor of Fine Arts from Ohio University in 2006 and her Master of Fine Arts from Bowling Green State University in 2012. While at Ohio University, Karyn studied Art History and Architecture of the High Renaissance throughout major cities and small towns of Italy. During her M.F.A., Karyn instructed drawing classes at Bowling Green State University. 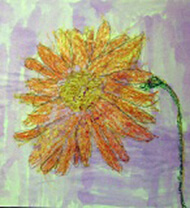 Since her M.F.A., she has worked at Terra Gallery and Cox Fine Arts Center in Columbus, Ohio. She has exhibited twice in the international art competition "Artprize" in Grand Rapids, Michigan. Karyn is enthusiastic about teaching art to others. Art classes for kids from Columbus, Dublin, Powell, Bexley, Clintonville, Delaware, Gahanna, Galena, Galloway, Grandview Heights, Grove city, Hilliard, Lewis Center, New Albany, Picherington, Reynoldsburg, Upper Arlington, Worthington, Westerville, and other Central Ohio communities.